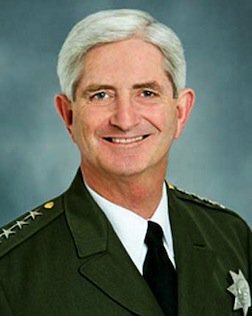 Suddenly San Diego County Sheriff Bill Gore finds himself dealing with a new state law declaring California a sanctuary state, restricting local law enforcement from cooperating with federal immigration authorities. This puts California at odds with the federal government, especially at the seven detention facilities his office operates. Since local, state and national law enforcement agencies have worked diligently through the years to forge a positive partnership of coordination and communication, Sheriff Gore’s diplomacy and 47 years’ public safety experience will be put to the test. His topic for the Nov. 14 luncheon meeting of the Navajo Canyon Republican Women Federated (NCRWF) at The Brigantine will be “Immigration and Jails.” We are eager to hear how our county sheriff will handle this controversial situation and expect another full crowd. Check-in time for the 11 a.m. meeting begins at 10:30 a.m. A full-course luncheon will be served at noon with Sheriff Gore following at 12:50 p.m. Cost is $25 and reservations are required. RSVP to NCRWF99@gmail.com (put luncheon in subject line) or call Marjie at 619-990-2791. Also on our speakers’ agenda is Brandon Jones, a political science student at San Diego State University and president of the San Diego State University College Republicans, which our club supports. He is also executive junior political coordinator of the San Diego County Republican Party. He is currently mired in a political controversy due to a letter he wrote requesting that the Muslim Student Association condemn the terrorist attack in Barcelona. That group took offense to his letter and their position is supported by the university administration. Because of this, he has appeared on Fox News and has also been physically threatened. NCRWF members are dismayed by the extreme campus politics we witness via television these days and are eager to hear his story. After our wonderful October Fashion Show, which was a very successful fundraiser for our club’s activities, we are happy to welcome the Warrior Foundation Freedom Station to our meeting. A portion of the proceeds garnered by the fashion show will be presented to Sandy Lehmkuhler, founder and president of Warrior Foundation Freedom Station. She will discuss their mission to be the leading force in assisting, honoring and supporting the military men and women who have so bravely served and sacrificed for our country. The slate for our 2018 officers with Kat Culkin as president, was presented at the fashion show. The election will take place at the November meeting, and the installation will be part of our annual Christmas party in December. You’ll see a new publicity chair in January. The California Federation of Republican Women biennial convention also took place this month and NCRWF delegates report it was quite memorable. Sally Steele, our club president, attended the September National Federation of Republican Women convention in Philadelphia. Once again, NCRWF was designated a Diamond Award-winning club, and she was proud to present it to our membership. — Judy McCarty is publicity char of the Navajo Canyon Republican Women Federated. Reach her at jhmccarty@cox.net.